Are the bubbles in a glass of Guinness® beer rising or sinking? An obvious reason why this question has never fully been answered is that most experimentation is carried out in pubs, and that might affect the judgment of researchers after five p.m. Recently, however, scientists have figured out the direction the bubbles move both experimentally (outside of bars!) 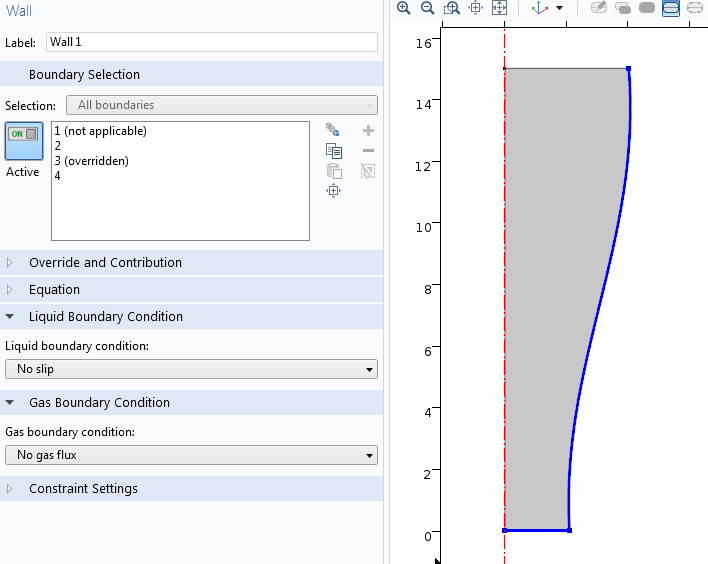 and numerically using the COMSOL Multiphysics® software (see the Further Reading section). 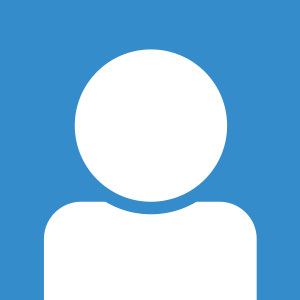 This blog post shows how to answer this question very quickly with a numerical method and provides a mechanistic understanding of the process. Why would an application engineer who does not drink Guinness® beer be fascinated by the motion of its bubbles? It turns out that the dynamics between gas and bubbles have very important applications in many industries, such as the food, chemical, and biopharmaceutical industries. Bubble dynamics is also a very prevalent subject in academia. The Bubbly Flow interface is the appropriate choice for modeling bubble dynamics in stout beers. 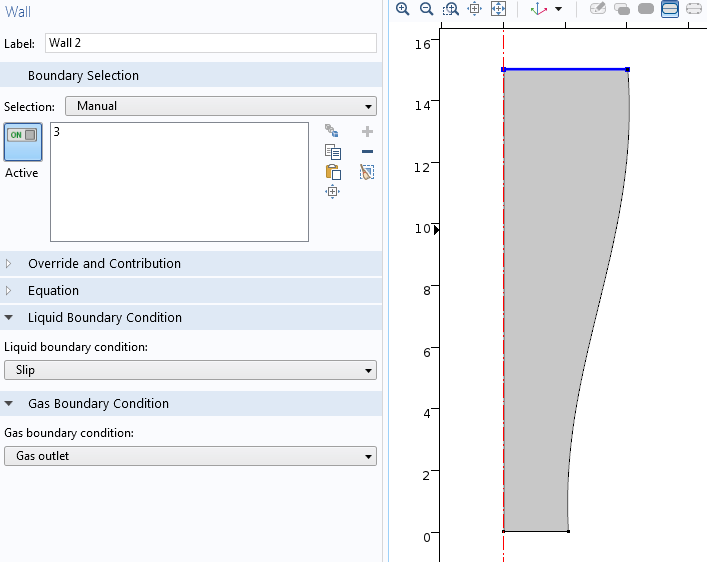 This interface, available in the CFD Module, solves for the beer’s velocity and pressure using the Navier-Stokes and mass conservation equations. It also solves for an additional transport equation to find out the concentration of bubbles in the beer. In other words, we are not individually tracking every single nitrogen bubble in the glass, as it would be too expensive from a computational point of view. Instead, we track the volume fraction of bubbles in the beer. 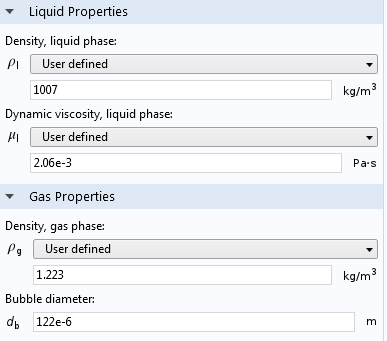 The material properties, i.e., the density and viscosity, for the liquid phase (beer) and gas phase (bubbles). One specificity of stouts is the use of nitrogen rather than carbon dioxide during the carbonation process, leading to finer bubbles. The geometry is built in the 2D axisymmetric mode in such a way that the total volume of the glass is equal to one pint. The side and bottom walls are set to the default No Slip velocity boundary condition with no gas flux through the glass. The top boundary is set to a slip velocity and a gas outlet, thus mimicking the free surface between the beer and the foam. The foam is not modeled here. A fully structured (mapped) mesh is built with boundary layer elements near the walls to fully resolve the high velocity gradient in the neighborhood of these walls. Note that the default physics-based triangular mesh with boundary layer elements can be used as well. More information on meshing can be found in quite a few previous blog posts. Fully mapped mesh for the glass. Are the Bubbles Rising or Sinking? Volume fraction of bubbles after 1.5 seconds. The color contour plot above shows the volume fraction of bubbles. 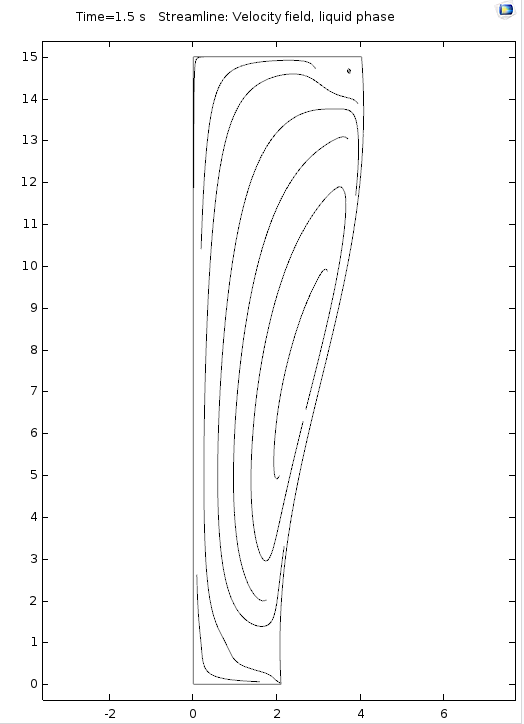 The initial volume fraction of bubbles is 2%. After 1.5 seconds, this value is lower at the bottom of the glass and near the side wall. Earlier, I mentioned “Irish pubs with proper glasses” because the shape of the glass is very important in creating this effect. The bubbles have been observed to sink for glasses that widen toward the top and rise for glasses that widen toward the bottom. 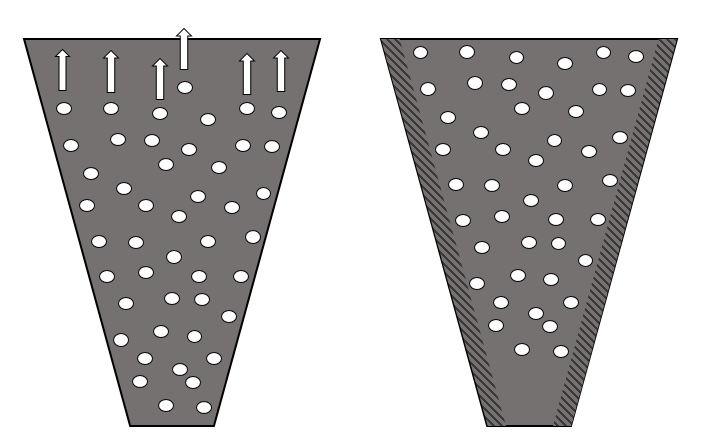 As seen in this schematic, rising bubbles in a glass with a wider top create a thin layer close to the wall with a lower density of bubbles immediately after the beer has been poured. Therefore, the liquid-gas mixture has a higher density close to the wall. A second or two after being poured, the fluid is close to being at rest. Because of buoyancy, the lower density fluid will rise to the top and the higher density fluid will sink. This is similar to the natural convection process, where hotter and thus lighter fluid rises with respect to denser, colder fluid. In this case, the higher-density fluid is the bubble-free region close to the wall, while the lighter fluid has the highest concentration of bubbles. Therefore, the fluid will sink close to the wall and rise in the center of the glass. 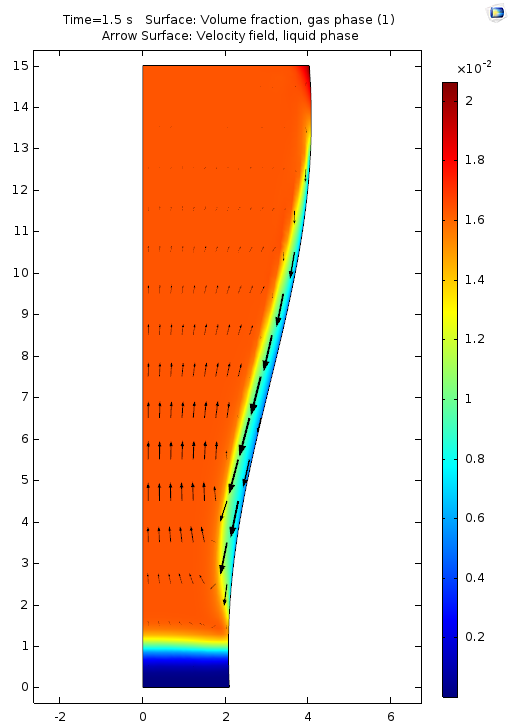 Streamline plot of the circulation pattern of the fluid in the glass. We have established that there is a circulation pattern in the glass, with the fluid rising in the center of the glass and sinking close to the wall (shown above). But still, shouldn’t the bubbles rise? The velocity of the bubbles in a fictive stationary liquid would be upwards due to buoyancy. In the bubbly flow model, this velocity would be the terminal velocity of the bubbles. However, the surrounding liquid sinks faster than the terminal velocity of the bubbles. Summing up these two effects, the bubbles are entrained downwards. To explain it in another way, the bubbles “want to go upwards” but are being pulled down by the surrounding fluid. On the other hand, in a glass that narrows at the top, the rising bubbles create a thin layer of lower-density mixture (higher bubble concentration) close to the wall and the flow circulation is reversed. Read more about the original research: Why do bubbles in Guinness sink? Guinness is a registered trademark of Diageo Ireland.